Patient had a car accident with facial trauma and lost ohis anterior upper teeth form right to left first premolars. The patient is wearing a removable partial denture; he referred he underwent to a previous bone graft surgery in an attempt to regenerate the missing bone structure following car accident and tooth lost. 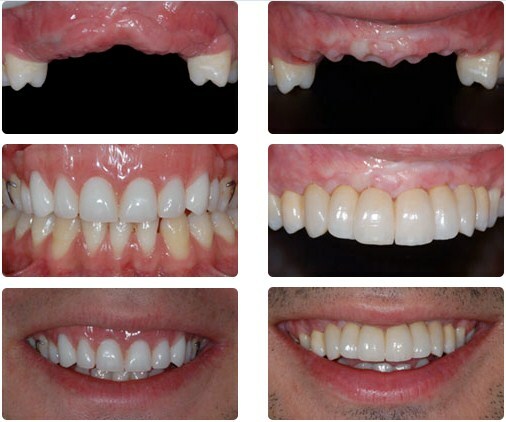 Final result following the connection of the four abutments with the osteointegrated implants and the cementation of a 8-unit full ceramic bridge. Please, note the perfect integration of the prosthesis with the adjacent teeth and gingival tissues. Final patient smile after completing the implantprosthetic rehabilitation. Patient is experiencing a sense of self-confidence and self esteem now.